Diving in The Similan Islands of Thailand is regarded as among the best in the world. There is a perfect balance of great diving, diving for all levels of experience, and even snorkelling and beach visits available. Our ever-expanding selection of Similan Islands diving boats is unbeatable for both choice and value. We have liveaboard and day trip boats to meet all needs and budgets. These include Similan liveaboards that are luxurious & spacious, fit your schedule perfectly, are good for budget travellers, and have the right balance of other divers on each trip. The day trip boats usually offer 2 dives per day, but the selection includes those that focus on shortest travel times, comfort and stability, and even lunch & diving from large diving boats that are stationed out at the islands. We truly feel that we have both the widest choice of Similan diving boats to suit everyone and the best service, before & after booking and while on board. How do you choose the perfect Similan diving liveaboard or day trip boat to match your needs, schedule, budget and diving level? This is easy. Instead of scrolling through the boats on this page, why not use our ‘date checker’ and after you enter the earliest and latest dates you’re available, you can scroll down on the right hand side and ‘filter’ the search results by including or excluding factors such as price, trip length, and more. Of course, often the easiest way is to ask us to give you the best advice on what diving trip at the Similan Islands would suit you best. We are online almost every hour of the day, and happy to help and answer questions. Please be prepared with your own information about your diver cert level, experience and needs. When choosing a Similan diving liveaboard, there are quite a few things to think about. Some people focus firstly on the price, while others need certain dates, and there are also lots of people whose most important factors are the facilities on board the boat and in each cabin. 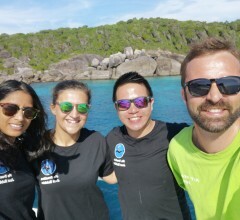 Most of our trips dive at The Similan Islands, Koh Bon, Koh Tachai, & Richelieu Rock, but there are some divers who want to make sure that they’re going to visit the dive areas most suitable to their needs, experience level and expectations. We also have a few boats that sail to the ‘Southern Islands’ of Koh Haa, Hin Daeng & Hin Muang. This is where we help most of our customers. It’s very difficult to choose the wide rande of Thailand liveaboards to best suit your needs, including budget, facilities, trip length & diving areas. This is especially important when you will be spending days & nights on board and have no escape or way to change your mind. We try to be as honest as possible in our descriptions of each boat and what it offers. And when customers contact us for help and advice, we are equally honest and can give advice about which options would best suit each guest’s needs. People from all over the world have different expectations and requirements when spending 2D1N – 8D8N on board a boat. Backpackers are prepared to sacrifice comfort for the best deal. More discerning guests are prepared to pay extra for the comfort of an en suite cabin, air-conditioned lounge, or fewer divers on each trip. Some ladies tend to insist on certain creature comforts, while most men are more flexible and easier to adapt. Choosing the best Similan diving liveaboard is something that needs to be done in good time, with the right information and advice, and taking into account everyone’s needs and desires. Are the Budget Scuba Dive Boats Comfortable? 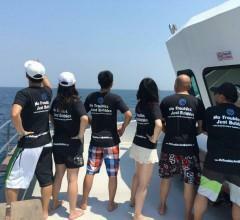 Budget Similan liveaboard diving boats are among our most popular. Almost all of them have air-conditioned cabins, and plenty of space to move around and socialise with other like-minded divers. Only Nangnuan is special in that the 8 guests sleep together on the boat’s covered upper deck. All of the other budget Similan liveaboards have comfortable single and double beds in air-conditioned cabins. Our budget boats have enough shared bathroom facilities for all guests to use, without having to wait too long. Also, sharing cabins and bathrooms encourages guests to communicate & socialise, which is what a lot of travellers want to do anyway. What More Do I Get By Spending a Bit More Money on a Liveaboard Trip? 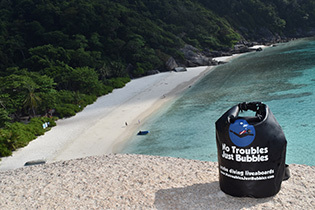 Similan diving guests who want a bit more luxury or privacy can choose from our mid-range & luxury diving liveaboards. These boats normally have an air-conditioned lounge/saloon and cabins with private en suite bathrooms. But what is more is that the staff employed on the boats tend to be more experienced in diving in general, diving at the Similan Islands, and aware of what guests need & expect. Choosing where to dive at The Similan Islands is not as simple as it may sound. Just out on the west coast from Phang Nga there are 2 national marine parks and two main diving areas, and these overlap. To better understand what is where, visit our dive sites page, but we can explain briefly here. 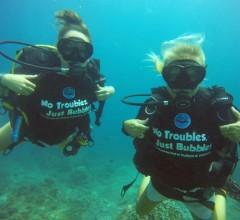 All liveaboard diving customers that book with us receive a FREE No Troubles Just Bubbles dive t-shirt. Click to see the offer! Book with us and get a free dry bag or beach towel! It’s quite difficult explain the different diving areas, but we will try. In short, there are two ‘main diving areas’ and two ‘national marine parks’ but they overlap to confuse you. In short, The ‘regular’ Similans is easy and colourful. The ‘northern sites’ of Koh Bon, Koh Tachai & Richelieu Rock are more challenging but more rewarding. However, to confuse you more, Koh Bon & Koh Tachai are officially within the Similan National Marine Park, and Richelieu Rock is within Surin National Marine Park. The Similan Islands is suitable for all levels of diver and is generally made up of sloping coral reefs on its east side, which are ideal for easy diving and to enjoy lots of exciting marine life. Also out on the west side the undersea dive sites’ topography is made up of granite boulders and different marine life, but visiting these depends on the boat’s itinerary and the needs and levels of the guests on board. Koh Bon is famous for Manta Rays from February to April. There is no beach here, but diving and snorkelling is very popular. Koh Tachai has a wonderful beach, but that is currently closed to the public 2016-2017. Currents can be medium to strong between the boulders. Richelieu Rock is far away and all underwater, but well worth the visit. Many regard diving Richelieu Rock as one of the top 10 dive sites in the world. 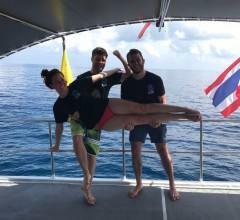 Another very popular area for Thailand liveaboard diving is Koh Haa, Hin Daeng & Hin Muang. These dive sites are far away from The Similan Islands, located between Phuket and Koh Lanta, and not far from Koh Phi Phi. They aren’t visited as much as the Similan Islands, so if you do a liveaboard there, you will possibly be aboard the only boat there. Whale Sharks & Manta Rays often visit and these islands are well worth a visit. Is My Diving Level & Experience Good Enough? Most of our Similan liveaboard dive boats welcome divers of all levels, and some even offer the PADI Open Water Course on board the liveaboard. 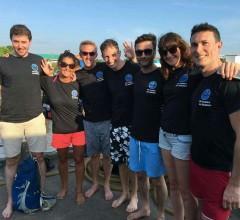 However, for certified divers, there are some prerequisites for some trips. A few boats insist on divers being certified to 30m, and if you’re not, you can choose between the Adventure Deep Dive or Advanced course on board. With regards to the date of your last dive, almost all of our boats need you to have dived within 1 year of departure. This is a grey area, because some divers have more than 50-100 dives but haven’t dived for 18 months, but there are also divers who have only 10 logged dives but the last one was 11 months ago. Nemo are an exception because your most recent dive can be up to two years before your liveaboard Similan diving trip. There are several Similan Islands diving day trips to choose from, and guests need to be aware of a few things. These include the dive sites to visit, the travelling time, and the logistics. We have Similan diving day trip boats to the ‘regular’ Similan islands, to Koh Bon, Koh Tachai and to Richelieu Rock. All of them depart from Khao Lak, so if you’re staying in Phuket, please understand that coming to Khao Lak is necessary. Some of our Similan day trip diving boats depart from Khao Lak’s Tab Lamu Pier, and some others depart from a pier in Baan Nam Khem, nearly an hour north of Tab Lamu. If you are staying in Phuket the night before your Similan Island diving day trip, it is very difficult and expensive to join a diving day trip at the Similan Islands. Staying in Khao Lak the night before your day trip is very important.